Soca jumped, waved and wined its way to victory at the Official Cup Match After-Party last night. Overwhelming applause from the crowd plus the judges’ scorecards proved soca the clear winner in what was a hotly-contested match at Tiger Bay. From the start, this year’s Soca Vs Reggae was a special affair. Thousands turned out in eager anticipation of seeing Jamaican reggae star Demarco go head to head with ‘Soca’s Royal Couple’ Fay-Ann Lyons and Bunji Garlin. And organizers Barmuvinjam pulled out all the stops to make this year’s event one to remember. There were giveaways galore from sponsors the Bermuda Department of Tourism (More Pink campaign), Digicel and WKD. 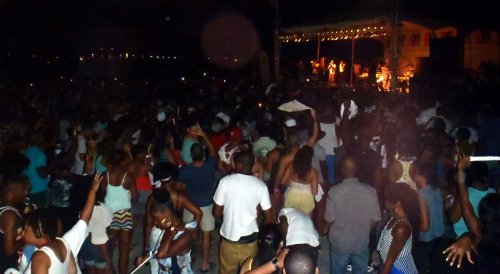 The St George’s venue was large and spacious, cooled down by breezes off the bay, and offering a nice contrast to the hot, packed-in crowdedness of Wednesday’s One Love, One Life concert at Par-la-Ville car park, Hamilton. If you were lucky enough to have a VIP ticket – and this was SVR: the VIP Edition – you were also treated to food, an open bar (sponsored by Three Olives vodka), a chic ‘lounge’- style seating area, an elevated viewing stand right of the stage, plus access to a stage-front dancing area. Walking in on a red carpet, girls in Carnival costume handed out giveaways while others handed out drinks. The tented VIP ‘lounge’ had comfy white sofa seats, flowers and chandeliers – quite classy. We were definitely spoiled and most people I spoke to said the $145 ticket price was “good value for money”. As for the music of the evening, this was hot, hot, hot! Split into four rounds, DJs Prezidential Elite and King Jyrus battled for Team Reggae while Chubb and Rusty G spun for soca. Prezidential Elite started off with Vicie Versie Love, and DJ Chubb with Swing Engine. It was difficult to decide who had the greater stage presence, as both did such a great job of getting us all up and running. The Team Soca girls however, really proved infectious with their masterclass in wining. The next two rounds featured King Jyrus for reggae and DJ Rusty G for soca. King Jyrus spun some big, beefy beats and then Rusty G brought some high-energy dance tunes. His first set however was unfortunately interrupted by a brief series of power cuts to the sound – about three in total – at around 12:10am. Round 5 was the performance round – and the one we were all waiting for - with Demarco the big hitter for Team Reggae up against husband and wife team, Bunji Garlin and Fay-Ann Lyons for Team Soca. Bounding onto the stage in a camouflage jacket and pants, Demarco was full of fire and won us over with an energetic, larger-than-life performance. The reggae star teased us with a lead into Dawn Penn’s You Don’t Love Me before launching into Chaka Demus & Pliers’ Murda She Wrote. Gyptian’s Hold Yuh was another crowd pleaser, and Demarco had a great stage presence, with plenty of audience interaction. There was a wine-off among the girls invited on stage, with the winner ending up gyrating around Demarco’s waist, leading to both of them then on the floor for some more X-rated simulation. 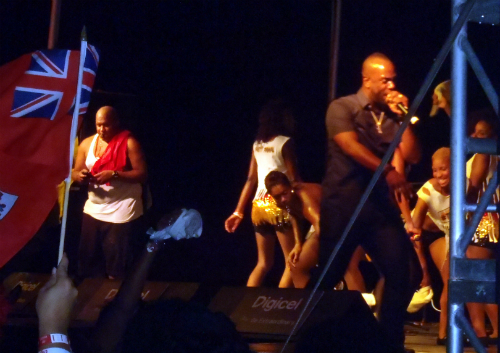 The singer also introduced a Bermudian rapper, Jelani, onto the stage to duet with him for I Love My Life. The sound quality of his mic however, let him down a little and we didn’t hear as much of him as we would have liked. ‘Soca’s Royal Couple’ Bunji Garlin and Fay-Ann Lyons however, crowned the evening amid a sea of jumping, wining and rag waving. Looking sleek, both dressed in black pants and tops, they began and ended with the biggest soca hit of the year, Differentology, sending the crowd into wild abandonment. Both artists gave it their all; the Lyon Empress singing hit after hit, while her husband knocked us out with a series of ‘raps’ faster than a speeding bullet. Garlin also referenced Bermuda’s own Collie Buddz and it was clear the couple were relishing their time here on the island. A fantastic performance all-round. This was one of the best nights out I’ve ever experienced in Bermuda. As a first-timer at SVR who spent the afternoon at the game (Cup Match Classic) at the Wellington Oval, I wondered how I would last out dancing until 3am. The energy, atmosphere and music at this event however is so infectious, before you know it the evening is coming to an end. Soca’s victory at the 7th SVR now brings the tally to four wins against three for reggae. This year’s judges were Teresa Minors, Lamont Robinson, Nikki Bascome and the Bermuda Sun’s own Glenn Jones.